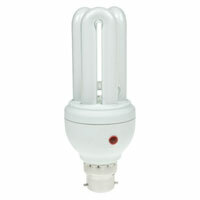 General Lamps Blog - Lock up and Light up! Test your security lights to check all the bulbs are working. Lights with a sensor are a great deterrent. Use lights in your home on a timer to give the appearance someone is in. To do this there are two options. Option 1: buy an energy saving lightbulb such as a low wattage compact fluorescent or LED bulb to use in a table or standing floor lamp. 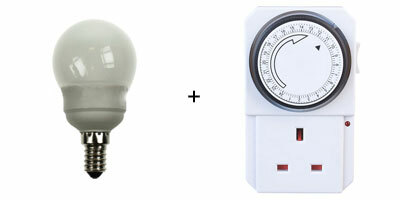 Then buy a simple timer socket to plug the table or floor lamp into. Option 2: use a dusk to dawn light bulb which has a sensor, automatically switching on during the night and off again as it gets light. “Sadly we find that people only think about their home security after they have been burgled. We want people to review their home security before they fall victim to crime. There are lots of simple and inexpensive things you can do such as using a light timer so that lights come on in your home when you are not there. A home in darkness is a gift to a burglar. They can tell there’s no one home and it gives them the green light to break in, using timer switches on lights gives the impression someone is at home." For more information and advice visit the Police.uk website.